As previous reports have occasionally mentioned, joint research on Yokoyama Taikan’s Yamaji [the Mountain Path] with Eisei Bunko Museum has taken place as part of a Department of Art Research, Archives, and Information Systems research project entitled Documentary Research on Cultural Properties. Taikan’s Yamaji in Eisei Bunko’s collection was exhibited at the 5th Bunten Art Exhibition (sponsored by the Ministry of Education) in 1911 and is an important work that inaugurated new forms of expression in Japanese painting with its vivid strokes. 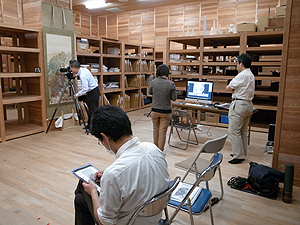 Upon completion of the piece’s restoration this spring, high-resolution images of the piece were taken on May 12th at the Kumamoto Prefectural Museum of Art, where the piece is held, by Seiji SHIRONO (National Research Institute for Cultural Properties, Tokyo), and the piece was studied by Hidekazu MIYAKE (Eisei Bunko Museum), Ryuta HAYASHIDA (Kumamoto Prefectural Museum of Art), Ayako OGAWA, and Jun SHIOYA (also of the Institute). Yamaji features extensive use of coarse paints made from mineral pigments, though this was not readily apparent in conventional images. The images taken during this study adeptly convey the nuances of the piece’s texture. In conjunction with the results of X-ray fluorescence analysis performed in the fall of 2010, high-resolution images should help distinguish the pigments used in the piece. Plans are to summarize these results in one volume and report them this year by means of a conference in August of this year. A second round of research exchanges between the Department of Intangible Cultural Heritage and the Folkloric Studies Division of South Korea’s National Research Institute of Cultural Heritage began based on an agreement concluded last November. During the first year of exchanges, Takakuwa visited South Korea for 2 weeks from May 18th to study Buddhist rituals. Buddhism plays a great role in both Japan and South Korea, but there are a number of differences in rituals and observances since Buddhism has developed in forms particular to each country. In South Korea, April 8th on the lunar calendar is Buddha’s birthday and a national holiday, and the Nento Festival or the Paper-lantern Festival is gaily celebrated 1 week prior to the Buddha’s birthday, even attracting tourists from abroad. Buddhists in South Korea, 90 percent of whom follow the Jogye order of Zen, worship Buddha every morning, noon, and night. 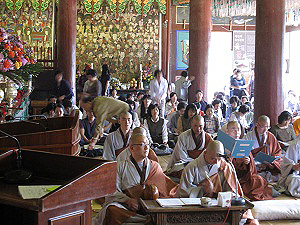 This practice is similarly followed by Japanese Buddhists, but South Korea Buddhists appear to be more enthusiastic, with believers participating in overnight retreats and praying with monks. In addition, religious ceremonies are considered “religious acts” and are not designated as important intangible cultural properties in Japan. In South Korea, however, religious ceremonies are treated quite differently, as exemplified by the Yeongsan-jae ritual of the Taego order that has been inscribed in the Intangible Cultural Heritage List of UNESCO. This comparative study of Buddhist rituals also revealed differences in Japanese and Korean perceptions beyond the Buddhist religion. Ugoku-Tanabata floats from Nagasuka ward in the City of Rikuzen-takata that were damaged by the tsunami. They have been assembled in a vacant lot in front of a wooden Buddhist monument marking houses that were washed away. 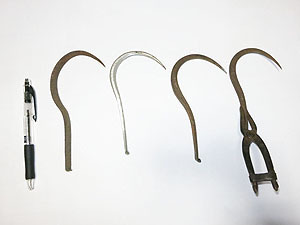 Hooks used in the Sanriku area to catch abalone. These hooks were made by local smithing. The blacksmith’s home workshop in the City of Rikuzen-takata was not damaged by the tsunami, but abalone fishing has not started since many fishermen were affected by the disaster last year. The blacksmith has also been unable to ship the hooks he has made. Damage to and restoration of intangible cultural properties in the coastal areas of the Tohoku region was studied. Over a year has passed since the disaster, but studies of intangible cultural properties and support for their restoration have lagged behind studies of and support for tangible cultural properties. Relevant organizations and groups have striven to collect and disseminate information on the damage and link providers of support with recipients, but support efforts have often failed to meet needs and too much support is provided where it is not needed instead of where it is needed. Such problems have arisen because of the lack of a network linking support efforts overall. In many instances, sites of folk techniques had not been determined prior to the disaster, and information on damage overall and needed support has yet to be obtained. 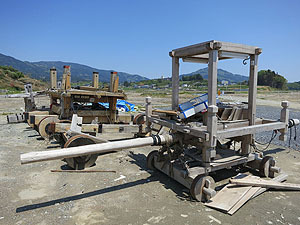 Many folk techniques use natural materials such as wood and clay, so practitioners face both the physical damage from the tsunami as well as radioactive contamination of materials as a result of the nuclear plant accident and harmful rumors. Determining the state of those techniques under such circumstances is difficult. 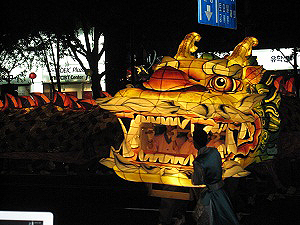 Although such problems exist, festivals and folk performing arts have been emphasized by local residents in light of prayers and memorials for the deceased. The strength of these cultural practices is more evident or is being reassessed in many instances since these festivals and folk arts have served as an important tie to bind disjointed communities with residents living in temporary housing. With a focus on conditions in stricken areas, the Department of Intangible Cultural Heritage will strive to collect information. The Department will also work to create new networks to provide support to stricken areas and respond to future disasters. 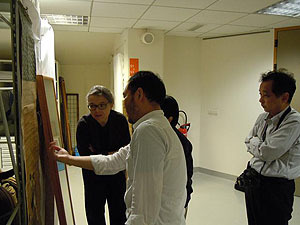 In 2010, the Institute concluded a memorandum of understanding on cooperative research and exchanges with the Guimet Museum in France, and the Institute has implemented joint projects such as lectures and restoration programs. The Guimet Museum of Asian Art began with the collection of Lyon industrialist Émile Guimet (1836～1918). Today, the Museum has about 11,000 Japanese artworks in its collection and is considered one of the world’s leading Oriental art museums. The Museum has one of the world’s oldest Japanese art collections, and its collection includes a number of works with significance in terms of art history. Some of these works are in great need of restoration due to the passage of time. As Cooperative Program for the Conservation of Japanese Art Objects Overseas, artworks of the Guimet Museum that included 5 paintings, i.e. Buddhist hanging scrolls and picture scrolls, and 1 piece of lacquerware were restored from 1997 to 2005. Consistently curating and exhibiting artworks in good condition is crucial to introducing Japanese culture and history overseas. With the cooperation of Hélène Bayou, the Museum’s chief curator of Japanese art, 3 Institute personnel—Wataru KAWANOBE, Director of the Japan Center for International Cooperation in Conservation, and Masato KATO and Tomoko EMURA, both of whom are senior researchers at the Center—surveyed a dozen or so paintings from the perspectives of restoration and art history on May 25, 2012. In the future, the Institute will conduct more in-depth surveys and provide further consultations regarding artwork restoration and encourage cooperative research and exchanges. Seven experts were dispatched from Japan to the Kingdom of Bhutan from May 28 to June 8, 2012 as a part of the Networking Core Centers Project commissioned by the Japanese Agency of Cultural Affairs. This Project started this fiscal year to teach and train personnel in conservation and restoration techniques, including structural assessments and aseismatic measures, for traditional buildings in the Kingdom of Bhutan. For the project to be implemented, a Memorandum of Understanding was first concluded between the Department of Culture, Ministry of Home and Cultural Affairs of the Kingdom of Bhutan and the National Research Institute for Cultural Properties, Tokyo. Terms of Reference were also agreed upon. 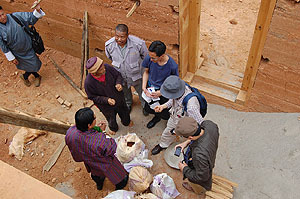 In cooperation with Bhutanese personnel, field surveys were conducted to elucidate traditional construction techniques used in temples, houses, and ruins with rammed earth and wood in order to identify the value to be conserved. In addition, questionnaires were drafted to facilitate future architectural surveys. Moreover, structural surveys were conducted in order to quantitatively ascertain the structural performance of traditional buildings. 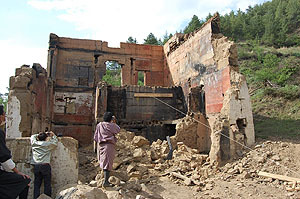 These surveys included a destructive load test on the rammed earth walls of Paga Lhakhang, a temple that was devastated by a fire and scheduled to be dismantled, and a materials test on the rammed earth blocks of that temple. Micro-tremors were also measured at Pangrizampa Lhakhang. Plans are to continue exploring the potential for aseismatic measures as an extension of traditional techniques through both architectural surveys and structural surveys. The Japan Center for International Cooperation in Conservation conducted a workshop on conservation of archaeological metal objects at the History Museum of Armenia from May 29 to June 8, 2012. This project was part of the Networking Core Centers for International Cooperation on Conservation of Cultural Heritage Project commissioned by the Agency for Cultural Affairs, Japan. This workshop was the second conservation workshop, following one in late January and early February of 2012. Ten young Armenian experts from the History Museum of Armenia and other institutes in Armenia participated in the workshop. The workshop began with practical conservation techniques with a focus on surface cleaning and desalination of archaeological metal objects, i.e. removal of corrosion and incrustation. The workshop included lectures on examples of conservation work in Japan, conservation techniques overall, and cleaning and desalination of archeological metals. The workshop also included practice with photography, condition check, exhibition/conservation planning, and conservation treatments. This workshop helped improve the knowledge and skills of Armenian experts. The next workshop will continue with surface cleaning, e.g. corrosion removal, and techniques to prepare objects for exhibition at the Museum after next year. Plans are to conduct an elemental analysis of objects once they have been conserved and study techniques for their fabrication in greater depth.